The Environmental Fair returns to Carshalton Park, Ruskin Road, Carshalton on Bank Holiday Monday 28th August from 10.30am to 8.00pm. This fabulous family day out offers something for everybody. Children’s activities include: a cycle obstacle course; face painting; circus skills; crafts and other games. We present a range of local artistic talent including; the Main Stage showcasing local rock, pop and young bands; the Music Café with acoustic folk, blues, country and more; and the Performing Arts Marquee which entertains with an eclectic selection of dance, music and entertainment. You can browse among over 150 stalls selling artisan local crafts, with interactive demonstrations, environmental information and promotion of local groups/sustainability initiatives. The fair includes a Farmers’ Market offering tasty local produce. Try some yoga, or relax with a massage in the healing area. The fair boasts a great range of delicious catering. From Thai noodles to French crepes, jacket potatoes, Caribbean food, Indian Street food and more. Savour quality beer at our bar by The Craft Beer Man. Or relax at the Music Café with a cup of tea and slice of home made cake baked by the Womens’ Institute. You must try too their special cream teas. Children under 12 get FREE entrance, 12-16 year olds and concessions are £3, adults are £5. Family deal ticket of £15 for families with two adults and up to three teenagers under 17. A special FREE bus service will bring you to the fair from all parts of the borough, so you can stay all day and take the bus home. Bus maps and timetables will be available before the event at local libraries and  www.envfair.org.uk There are parking restrictions in the surrounding roads and we only have very limited parking onsite for those with disabilities who have blue badges. Or come by bike and bring a lock for the cycle parking area where Dr Bike will check your bike over – for free! 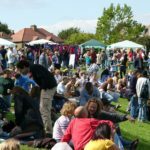 The event is organised by EcoLocal, a Carshalton based charity, which runs the fair with the help of many volunteers. If you would like to help as a volunteer steward at the fair we will give you free fair entry and refreshments as well as a great day out. If you would like to help before the event too, email or phone us.